Without awareness, there can be no wisdom and life becomes meaningless. Only with awareness is there wisdom, then life becomes fulfilling. Don’t miss the precious opportunity to raise your children well.Only a well-adjusted child grows into a well-adjusted adult. And it is a well-adjusted adult who will contribute positively to society. Be vigilant. Live mindfully. Two instructions of the Buddha. The persistent use of Sati is the way to attain Nibbāna. You may have good Kamma, but succumb to laziness and life cannot be fulfilling. You may be intelligent, But succumb to laziness and success will elude you. If you do your job properly and I do mine, what’s there to say? If you seek a happy life, always be aware. When you maintain awareness,The mind remains clear and happiness abounds. If you don’t forget to be aware – Nibbāna. If you do forget – the grave. Appamāda means not forgetting. We remember to be aware in order to develop wholesome qualities. This leads beyond death, to the Deathless. Pamāda means forgetting. We forget to live a wholesome life and this leads to death -again, again and again. So don’t forget to be aware of what you say and do – always. Only then do we really know the Buddha. If there is any kind of suffering, the cause is your own doing. Defilements of the mind can arise with every sense contact. Nothing less than constant and persistent awareness will prevent their taking hold. True maturity of heart and mind is achieved through growth and development. The Sāsana depends on those with a noble heart, well-versed in the Teachings of the Buddha, who have Sīla, Samādhi and Paññā.Only then, with patience and perseverance, can someone effectively serve the Sāsana. We meditate to develop Right View. This cannot be achieved by the ego; meditation must proceed naturally by watching any　experience just as it is. This is the way to develop Right View. Attakilamathānuyoga (indulgence in pain, self-mortification) and Kāmasukhallikānuyoga (indulgence in pleasure, self-indulgence) are the two extremes from which we must free ourselves. When we are free from one extreme, we tend to get caught in the other. Only with awareness and Wisdom can we find the Middle Way (Majjhima Patipadā). Be aware until the light of wisdom appears! We need to have a good heart and the right attitude in every situation. If others are right, be happy for them. If others are wrong, have sympathy for their misfortune and give them what help you can. Then there will be harmony. Old age, death and separation are unavoidable. Kamma (action) determines your future. Only Ñāṇa (wisdom) can set you free. Thinking “If you’re good then I’ll be good” actually implies “If you’re not good, I will be bad”. This is really a frightful attitude.A truly virtuous person is one who remains virtuous regardless of how others behave. What is it in your life that you are relying on? Psychics? Gods? Rites and rituals? Astrology? Lucky charms?Remember, it is actually only Kusala Kamma (wholesome action) that we can rely on. Belief in lucky days and unlucky days is just superstition. But it is truly lucky if we can spend the day full of Right Thought, Right Speech and Right Action. And it is really unfortunate to spend the day full of Wrong Thought, Wrong Speech and Wrong Action. Remember this! Practising Satipaṭṭhāna weakens the kilesās. When dosa arises, stay aware of it and it won’t last long. When lobha arises, stay aware of it and it won’t get what it wants. This is how the kilesās are weakened. Alobha is the opposite of lobha which is being stingy, not wanting to give. If you can remove greed for even one moment, that’s alobha. Adosa is the opposite of dosa which is getting frustrated or dissatisfied when you don’t get what you want. If you don’t want to have dosa, develop metta. When there’s no dosa, that’s adosa. Amoha is the opposite of moha which does not know when there is anger and greed. To eradicate moha we have to keep a good hold on Sati. The last A, Amoha comes only with mindfulness and wisdom. People lose even a little bit of money and Oh! How they cry! How about the billions of kusala they are losing every second? Nobody knows to cry over that. In the world, auditors go from office to office checking accounts to see that they balance. But don’t just monitor the business accounts; monitor your thoughts, words and actions. In balance, is your conduct more wholesome or unwholesome? Every day it is important to audit your conduct. Being vegetarian or eating raw food (food untouched by fire) doesn’t mean the fires of defilements aren’t touching you. It isn’t the food itself that determines if there is any defilement. To be free from the burning of defilements while eating requires mindfulness and wisdom. That is what matters. Now, while you have the opportunity, it is important to build a strong practice. In times of adversity we will regret it if we aren’t adequately prepared. Therefore we must practise now while conditions are favourable. 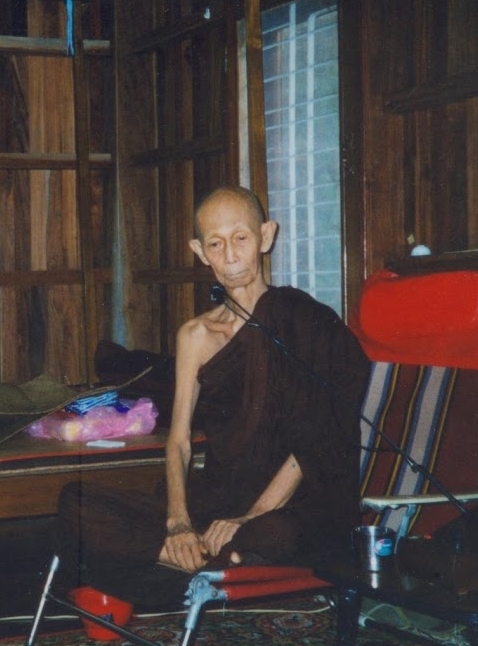 The quality of your understanding of the Dhamma cannot be measured by others. You have to actually practise the Dhamma and develop your own wisdom to see the Truth for yourself. You can’t experience the Dhamma through reading or listening to others. Try it now and you will understand now. Ask yourself “Is the mind pure or not?” Just look. Every moment of awareness is a moment of purity. If we are attached to having only good experiences in meditation then bad experiences tend to come. If we are averse to bad experiences, good experiences tend not to happen. Meditation is knowing how to simply watch the experience, whether it be good or bad. If we can watch like this, we will realise that things are simply the way they are; there is no inherent good or bad. Our responsibility is merely to acknowledge whatever we are experiencing.